Easter is only a week and a half away, so it is a great time to finish up those Easter cards to give family and friends, create a few adorable Easter goodies, and make some decorations for your home. Below is a round-up of some of the cute Easter and Spring themed projects that have caught my eye recently. ​You could make the paper version to use as place cards for Easter dinner or as a tag on an Easter gift/basket. The felt version could be worn as a spring brooch or add a few to a spring wreath for your front door. The possibilities are nearly endless with these adorable birds. For a template, click here. Get crafty with the kids and create Easter décor in the meantime! Look how cute this egg wreath is! The patterned paper paired with the solid makes for an adorable layout, or have your kids decorate solid colored eggs and make a wreath with those. Great variations of this would be to use solid color paper/cardstock and “mix media” it up with distress inks, acrylic paint, Nuvo Crystal dots and more or create one from gelli prints that you make on a gelli plate. ​Grab your gesso, distress paints, gel medium and stamps to create artistic eggs for décor. ​For a tutorial on how to make these awesome eggs, click here. 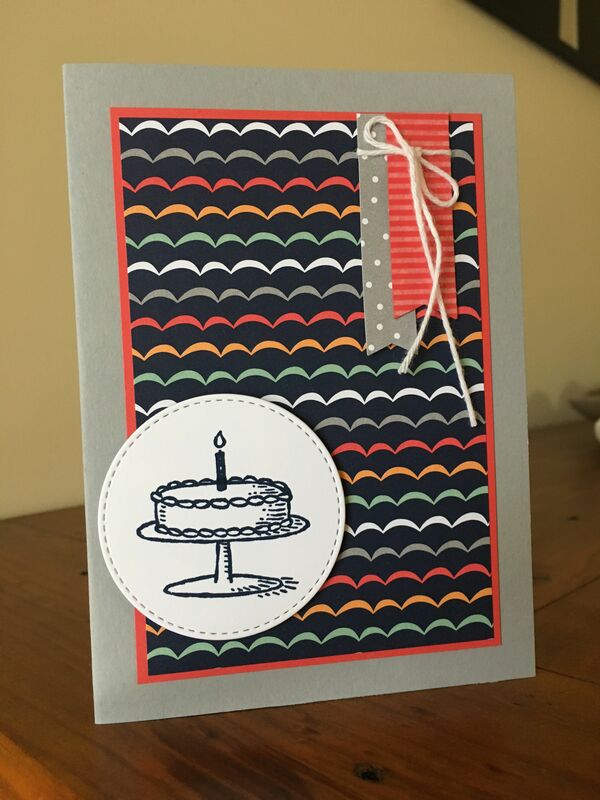 Make a cute front for a card or piece of artwork to hang by using strips of paper or washi tape. You can easily create striped backgrounds that can be turned into eggs, bunnies and more. Just some of the adorable washi we have in the Shoppe to use for a project like this. ​Make a garland to hang. ​Create an adorable bunny garland to hang and don’t forget the cute fluffy bunny tails! ​We have a great selection of stamps and dies for you to use in your creations. Just a small sampling of the spring and Easter stamps and dies we have in stock! Here is some inspiration using the stamps and dies shown above. Source for all these images. In the spirit of March, my favorite "green" products! In the spirit of St. Patrick’s Day next week, I thought I would share a round-up of some of my favorite “green” products that Palette & Paper carries (to be honest, I love these products in all of the colors they come in!). Palette & Paper carries a variety of ink pads and first it can be a little overwhelming as to why someone would need so many different kinds. Here is a quick rundown of some of the properties of the inks and projects they are suitable for. Momento Ink Pads are fast-drying, fade resistant dye ink and is a great ink to use in paper arts. It is a water-based acid free ink that dries on all paper surfaces, including coated papers and vellum. Once it is dry it won’t smear, even when using alcohol markers (i.e. Copics) to color in stamped images. Archival Ink Pads provide lasting stamping results that are permanent on many surfaces. With them you can get a crisp image that doesn’t bleed over water-based inks and markers, acrylic paint and water colors. Archival Ink dries on matte surfaces and can be heat set on glossy surfaces. It is acid free and non toxic. StazOn Ink Pads are solvent based and designed for decorating on-porous surfaces such as glass, metal, shrink plastic, cellophane, aluminum foil, leather and acrylic. It can also be used on paper. Taylored Expression Ink Pads are dye-based, fade-resistant ink that can be used in paper crafting. It is custom formulated to match Taylored Expressions cardstock (also available at Palette & Paper). The mini pads are only $3 making it cost-effective to expand your color inventory of stamp pads and the small size is convenient for packing for crops or creative weekends (have you registered for the next creative weekend at P&P yet? It’s this weekend!). I absolutely love the extra pop that baker’s twine adds to paper crafts and gift wrapping! Below are just a couple of great examples using this product. These concentrated micro fine watercolor powders let you create beautiful watercolor techniques like never before! You can use them “free-hand”. Mix them with water and paint with them as you would other watercolors. Make unique flower bouquets with Color Bursts by dyeing white/light colored flowers. Ken shared a lot about this in a recent Facebook video. Use them to paint through a stencil. Again, I love projects with texture and dimension, so adding felt to a project makes me happy! You can die cut flowers and other shapes to use as embellishment on cards. Use the felt in collage name tags and other fabric art. Die cut an adorable cupcake topper. Washi tape, washi tape, my life wasn’t complete until I discovered washi tape! Seriously though, washi tape can be used for SO MANY THINGS! You can use it in card making and decorating envelopes. You can decorate cute goody bags for a party or gift giving. Rip it, layer it and make an awesome tag to use on a gift or as a base which you can stamp, add hand letting to, etc. Pop into Palette & Paper and pick up some green items this week! Or any color of the rainbow . . . or maybe something gold for a little luck of the Irish! Below Creative Team Member, Kimberly, is sharing her love of Traveler's Notebooks and how she records vacation memories in them. Check back tomorrow for Part 2. ​With every trip I take I like to create an album of some sort to house pictures and memories in. I absolutely love revisiting the album and walking down memory lane for years to come afterwards. The type of albums I have made have differed over the years – everything from chipboard albums to Project Life type binders and more. The past couple of years though I have been using the “Travelers Notebook” system to keep track of everything from grocery lists to expenses to to-do lists and so much more. I have also started creating a Traveler’s Notebook insert for each trip. It ends up being a great size and very “manageable” when it comes to getting it complete. That is a big factor for me – the easier it is to complete the more apt I am to getting it completed. These types of inserts are also great for kids to record their travels and summertime adventures in. ​Below is the general process that I use in creating my vacation Traveler’s Notebook Inserts. Step 1: Make an insert out of plain paper for the insides and a sheet of decorative paper for the cover. Add pictures and/or ephemera to the cover. Or if you prefer, buy a blank insert and decorate the cover with paper, pictures and/or ephemera. Step 2: While on vacation take pictures. Lots of pictures and don’t forget to ask a stranger to take a picture of you/your group or use the selfie method. This is a no-brainer because pictures really are worth a 1,000 words and even more words with your smiling face in them! With so many cell phones having good cameras nowadays there’s no excuse to not take a lot of pictures. Tip 1: Before heading out on your vacation be sure to have lots of storage space on your phone or memory card in your phone. Tip 2: Find something “cool” about the place you are traveling to and take repetitive type pictures. For example, take pictures of front doors on houses if the city you are visiting has interesting architecture or do a series of pictures featuring “round” things (i.e. man hole covers, tile designs, anything and everything that has a circle on it). This will make you look at everything through a new set of eyes. Recently, I toured the Biltmore Estate in Asheville, NC. The whole estate was amazing, and I took pictures of a lot of things, but one thing I focused on was the ceilings. On the first floor of the house each room had a different ceiling. I love the little “series” of pictures that this provided. Step 3: Collect ephemera. I always pick up a variety of those “free publications” you can find while on vacation and business cards. I use pictures from brochures, snippets about restaurants and places to go, along with postcards and bookmarks I buy in my Traveler’s Notebook insert. Also, I keep receipts from everything, including the fast food place we lunched at while on the road. Not everything will make it in the final album, but it helps me remember places and locations. Step 4: Take notes. Use the notes section in your phone or a little notebook to document little things – a funny saying that keeps coming up during the vacation, list the songs in your road trip play list or the podcasts you listened to, what everyone ate at dinner, historic facts or fun tidbits about the locale, etc. Spending a few minutes a day keeping track of things like this will help greatly when putting your album together. Step 5: Within the first couple of days of being home revisit your notes and try to “round them out”. Add information to your notes, google for information you can’t quite remember. If you didn’t get a picture of something or place you really would like to include, google it! Collaborate with others that you vacationed with and share pictures or tidbits. Tip 1: Make an A to Z list capturing memories from the trip. I learned this tip from Amy Tan (aka Amy Tangerine) and have loved incorporating it into my albums. It is a good way to include random snippets or memories. Check back tomorrow for Steps 6 - 10! A look at a couple of the pages in my Traveler's Notebook from a long-weekend trip Asheville, NC.